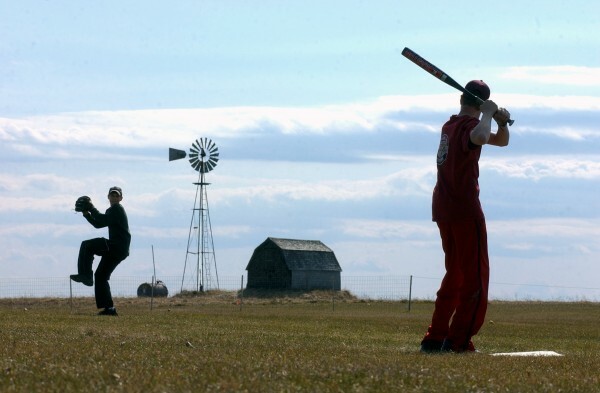 Justin Bouchard (left) winds up a pitch for Jordan Haines as they hone their baseball skills in a field between the two boys' homes in Caribou on a sunny afternoon in 2003. Maine was the most rural state in the nation in 2010, according to new data from the U.S. Census Bureau. The nationwide trend was toward a growth in urban populations. According to the new data, 61.3 percent of Maine’s population lived in rural areas. “Rural areas” are all those that aren’t classified as “urban.” The Census Bureau views areas with populations of at least 2,500 as urban — though it differentiates between urban clusters (at least 2,500 people and less than 50,000) and urbanized areas (50,000 or more people). This is different than population density, which is measured by how many people live in a square mile. Maine has three urbanized areas — Portland, Bangor and Lewiston — and 24 urban clusters, ranging in size from Calais (population 2,504, according to the 2010 Census) to Brunswick (population 29,159). The state’s most rural counties are Piscataquis and Lincoln, where 100 percent of the population lives in rural areas. Maine beat out Vermont as the most rural state, changing places over the last decade. According to the Census Bureau, 61.1 percent of Vermont’s population lived in rural areas in 2010. In 2000, Vermont was the most rural state at 61.8 percent and Maine was second at 59.8 percent. Maine bucked the national trend by becoming more rural over the last decade. The rural nature of the state as evidenced by the new data has implications on a variety of areas in Maine, including spending on government services, infrastructure and other issues. That includes health care, transportation, education, “pretty much anything you can think of,” Lachance said. “The fact that we are spread out, that our population is growing slowly, growing older, just creates a bit of a challenge that we need to step up and create our plan for how we’re going to deal with it,” she said. Some of those innovations can be technology-based, Lachance said. For example, improved rural broadband infrastructure leads to initiatives such as telemedicine, LaChance noted, where experts hundreds (sometimes thousands) of miles away support doctors and nurses in rural hospitals. Broadband technology can also help students in rural schools, adult education learners and others. Even as Maine and some other states remain decidedly rural, growth continues in urban centers. Though, according to the data, there were no new “urbanized areas” that appeared in Maine as of 2010. According to the Census Bureau, the country’s urban population increased by 12.1 percent from 2000 to 2010, outpacing the nation’s overall growth rate of 9.7 percent for the same period. “It tells us something about the nation, it’s all part of showing us the portrait of America,” Stacy Vidal, public affairs specialist at the Census Bureau, told the Bangor Daily News. Vidal added that policymakers, federal agencies and others use the definitions and data as a baseline for funding formulas, policy and program decisions and more. The new data did show some growth in Maine’s urban areas between 2000 and 2010. The Bangor area had a population of 61,210 in 2010, up 2,227 from 2000. Lewiston hit 59,397, an increase of 8,830. And the Portland area, Maine’s biggest urban population, hit 203,914 in 2010, up 15,834. The federal government notes that population increase in any urban area may come from internal growth, outward expansion to include new growth, and outward expansion encompassing existing communities that previously were outside the urbanized area. Lachance said that in Maine, sprawl has been an issue for the past 50 years. But that trend has started to reverse due to the expense of living far from where you work. And while the costs of state and local governments are often criticized as being out of control, Lachance said the spread-out, rural nature of Maine was a big factor in those costs. Particularly on the local level, municipal governments are not “off on spending sprees,” she said. According to the census data, only 1.17 percent of Maine’s 33,215 square miles would be considered “urban,” while 98.83 percent would be considered “rural.” In 2010, the state had a population of 1.3 million people, with 513,542 people living in urban areas and 814,819 living in rural areas.